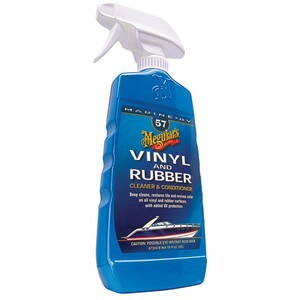 Meguiar's Vinyl & Rubber Cleaner/Conditioner is specially formulated to clean and revitalize your boat's vinyl and rubber surfaces. Helps to restore color and give it a rich natural sheen but not the typical artificial shine you get with conventional products. Meguiar's Vinyl & Rubber cleaner also helps to deflect harmful UV rays that can dry out and crack a surface.